So you’ve booked your dream vacation and plan to get in as much down-time as you can. But you still want to stay connected with your family and friends at home, or just need to be reachable in case of emergency. Do you take your phone? Will it work? How much will it cost? Here are some helpful options and considerations. Which option you select will depend on where you’re going, how long you’ll be gone, and how much you’ll be using your device. For example, if you just want to be accessible in case of emergency, using your current phone with international roaming is probably easiest. If you want to check in with your loved ones each night or keep up on email, using WiFi at your hotel might be your best bet. If you are a data addict or will be making a lot of local calls, getting a local SIM card or renting a phone locally could be the option for you. Taking your phone with you and using it as normal will often be your easiest and most expensive option. Your U.S. phone should work in Canada and most parts of Mexico and the Caribbean. But unless you have a ‘global ready’ phone (such as the iPhone 5s or 6 or Samsung Galaxy S 4 or 5), it may not work in other countries. Call your carrier before you go and find out whether your phone will actually work abroad—for both voice calls and other features. Ask about coverage areas, international rates for calls and data, and special roaming plans that you can enable temporarily while traveling. Here are some examples of international rates from AT&T, Verizon, Sprint and T-Mobile. You’ll want to do everything possible to reduce your data usage abroad—see our hints below. Outside of major cities, don’t be surprised if your 4G device which is normally speedy at home falls back to much slower 3G or 2G speeds—or has no data coverage at all. You could be paying a premium for frustratingly slow data speeds or voice-only coverage. A SIM card is a small removable microchip that identifies your device to the network and associates your phone number with your phone. Most cell phones contain a SIM card, though some Verizon and Sprint phones do not. 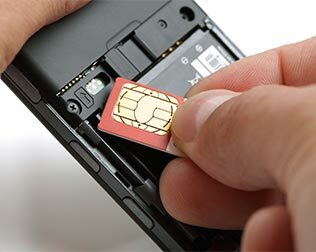 Replacing your SIM card with a local one transforms the identity of your phone, giving you a local number and local rates. (It shouldn’t have any effect on your contacts, photos, music, or apps.) It’s like getting a local phone, but with less hassle. First, ask your carrier if your phone will actually work abroad and is compatible with the networks at your destination. Next, ensure your phone is unlocked—not restricted to a particular network. Most carriers will let you unlock your phone, but usually only after a certain amount of time has passed on your contract and for a small fee. You can also buy phones that are already unlocked with no contract (Amazon: unlocked cell phones). You can pick up a SIM card before you go (check out Mobal, OneSimCard, CellularAbroad, and Amazon). Or buy a local one upon arrival—they’re often available at the airport, at convenience stores, sometimes even in vending machines! But do a little research before you select one. In particular, be sure to find out the coverage and rates, especially if you intend to use the card for international calls. SIM cards come in different sizes—standard, micro & nano—so make sure you get the right one for your phone, and make sure you know where it is and how to remove it. This is a great option if you’ll be making a lot of local calls while abroad. The downside is that anybody calling you from home at your U.S. number won’t be able to reach you (unless you set up some fancy forwarding). You’ll need to give them your new (temporary) local number, and international rates will apply. If your phone won’t work at your destination, and/or will be making a lot of local calls while you’re traveling, consider buying or renting a phone just for your trip, preferably one with no contract and pre-paid credits. You can pick up a phone before you depart from companies like Mobal, OneSimCard, and CellularAbroad, or get one locally once you arrive, which can be even cheaper still. Keep in mind that you may have to learn how to use this new phone, and options for sending text messages, installing apps and using data may be limited. And if you plan to make international calls, make sure you buy enough credits, which can be expensive. These days, free (or cheap) WiFi Internet is everywhere—at musuems, coffee shops, hotels, airports, airplanes…even on some trains and buses. If your phone can connect to WiFi, then chances are you can disable the cellular network and only use WiFi. You won’t be able to use your phone for much when you’re not in range of a WiFi signal. But whenever you are, you’ll enjoy free unlimited connectivity, and with a couple of apps, you may be able to use your phone as usual—almost. 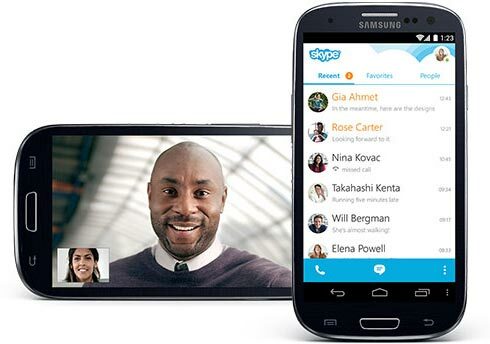 To make voice and/or video calls using WiFi, you will need a WiFi calling app (sometimes called VoIP). Phones from T-Mobile come with one pre-installed. Otherwise, download one such as Skype or Viber. For text messages, try WhatsApp. iPhone users can use FaceTime and iMessage to connect with other iPhone users (though these tend to need a faster WiFi connection). If you have a Gmail account, you can use built-in chat features to call or text the U.S. free of charge. There are plenty of other options, so try a few before you go. Note that you can use WiFi with any of the other options described above, to reduce your use of the costly cellular network. But also remember that WiFi can sometimes be slow, unreliable or even nonexistant, especially in developing countries. We couldn’t mention WiFi calling without a special shout-out to Republic Wireless, a small but promising U.S. carrier. Their phones use WiFi first and (with an appropriate plan) fall back to the Sprint network when WiFi isn’t available. They don’t offer international roaming yet, but with their $5/month, no-contract, WiFi-only plan, you can take your phone abroad and use it like usual, making and receiving calls and text messages just like at home, with no special apps—but only when you’re connected to WiFi. We’ve tried it and it works great. Smartphones these days can cost a small fortune. Are you sure you want to risk taking yours overseas where it can get broken, lost or stolen? You might instead consider bringing a small, inexpensive tablet (Amazon: tablets). With a WiFi connection and the appropriate apps, you can make and receive voice and video calls, check email, and browse the web. 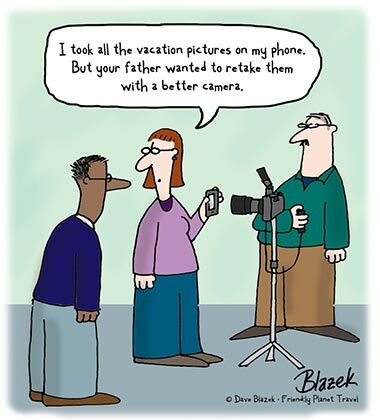 Accustomed to taking photos with your phone? Consider an inexpensive digital camera, which may take better photos. Dependent on map apps? Think about carrying a standalone GPS device, or getting one with your rental car. Another interesting option: take a WiFi hotspot with you. SkyRoam offers just such a product: a pocket-sized device which provides a wireless Internet connection for up to 5 devices. For a flat daily rate, you’ll enjoy unlimited data with no overage charges in more than 45 countries (more coming soon). It works through local cellular networks, but you won’t be fussing with any SIM cards. We haven’t tried it yet, but it’s an enticing new option. 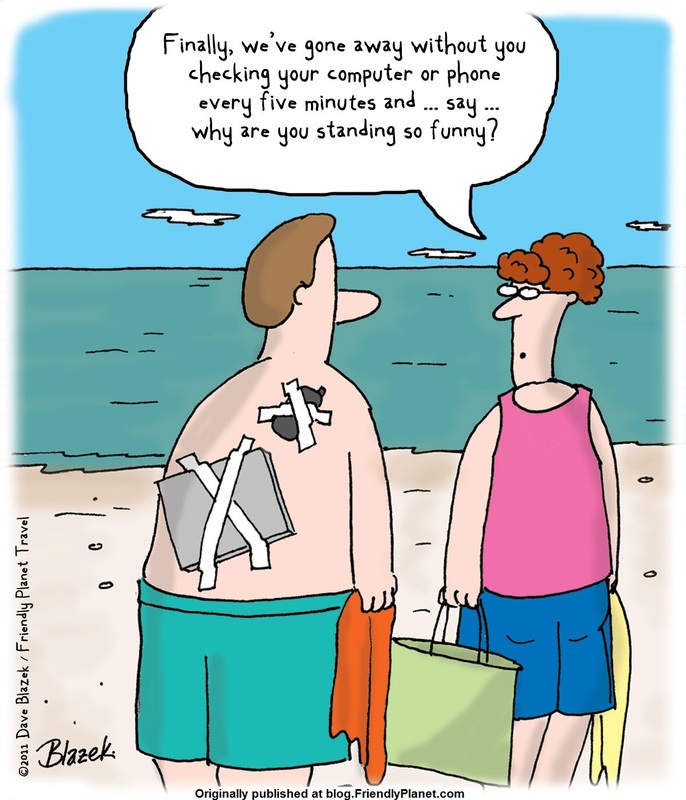 Disable data roaming while you’re away to avoid using the cellular network and racking up charges. iPhone users: tap on Settings > General > Network > Data Roaming and toggle to “OFF”. Android users: Tap on Settings > Wireless and network > Mobile networks > Data roaming and uncheck it. Or in most cases, you can simply set your phone to ‘Airplane Mode’ and then manually re-enable WiFi. If you are using data, track your usage. Most phones have this option under ‘Settings.’ Some also have an option to set a data limit and display warnings when you get close. Configure email and other apps so they don’t automatically download data. Otherwise, simply turning on your phone abroad could leave you with huge unexpected bill. Using Google Maps? Cache maps of the places you’ll be going so you use less data when out and about. You can do this for many geo-location reliant apps. Print out the international dialing codes you’ll need for local calls and/or dialing home. Bring a list of your important contact numbers too, written out with the international dialing format. Use hotel phones to call other rooms—and to make local calls, if there’s no charge. And most hotels don’t charge for incoming calls, in case somebody needs to reach you. Consider suspending your cell phone account at home, if you won’t be using it and your contract allows it. Most providers charge a small fee for this, but it’s generally less than your normal monthly rate. Note that outside the U.S., the terms “mobile phone” and “SMS” are often used instead of “cell phone” and “text message”. 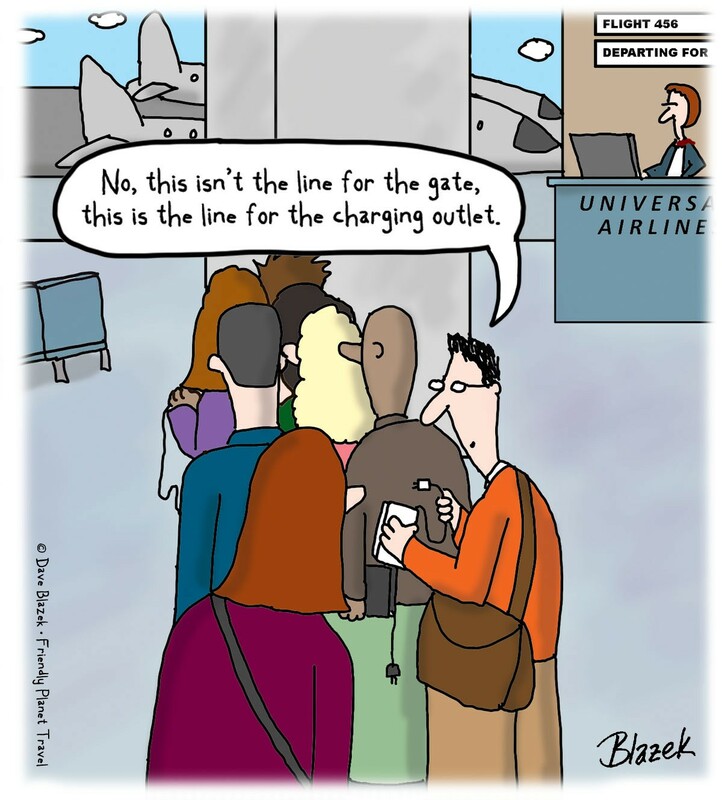 But wait: how will you charge your phone or tablet abroad? If your device can charge from a USB port, you might get away with bringing just a USB cable. Some airplanes have USB charging ports at your seat, and many hotels have charging ports at your desk or in a bedside lamp. But it’s a safer bet to bring your own charger. 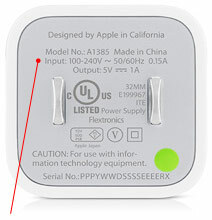 And the good news is that virtually all modern chargers and USB power blocks will accept 100–240 volt power, so they’ll work just about anywhere without a voltage converter—but check the fine print on your charger to be sure. The problem is that the plug probably won’t fit, so you’ll need a simple plug adapter for your existing charger (Amazon: travel plug adapters). Or just get an inexpensive travel charger (Amazon: international travel chargers) appropriate for the countries you’re visiting. To protect your devices, you also might consider a small surge protector. 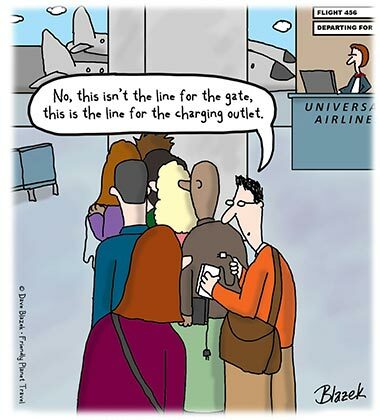 But finding a place to charge your phone might not always be easy—especially at the airport! Spend a few bucks on an external charger/battery pack and you’ll enjoy 2-6x your regular charge (Amazon: cell phone external batteries). Or if you can access the battery in your phone, considering purchasing an inexpensive second battery that you can swap in as necessary (Amazon: cell phone internal batteries).